The Knights couldn’t throw a strike. The Hurricanes didn’t complain. Top-ranked Miami drew 14 walks against eight different pitchers in its 8-4 win against Central Florida for the team’s 11th consecutive victory this season at Mark Light Field on Wednesday night. The Canes (27-4) got on the board early with one run in the first when UCF pitcher Bryce Tucker walked senior shortstop Brandon Lopez with the bases loaded. Right-handed sophomore Jesse Lepore (5-0) kept the Canes ahead with a perfect first three innings, including five strikeouts. “I felt comfortable, especially in the early on innings,” Lepore said. The Knights (18-17) opened bottom of the third with Thaddeus Ward on the mound, their third pitcher of the game after a pitching change in the second. Ward again walked in a run for the Canes, this time giving sophomore center fielder Carl Chester a free pass with the bases loaded. Ward continued to struggle, walking the next batter to bring in another run. UCF could not stop the bleeding, as a wild pitch from Ward let junior Randy Batista steal home. With the bases again loaded, junior Jacob Heyward knocked a two-RBI single to center field, giving the Canes a 6-0 lead. The Knights scored their first run in the fifth inning, when Lepore allowed his first hit of the game on an Anthony George double to the left-field warning track, sending Luke Hamblin home. It appeared the Knights were going to score again when Matthew Mika hit a ball over the head of the Canes’ junior second baseman Johnny Ruiz, but junior right fielder Willie Abreu threw out George at home plate. The Canes extended their lead to 7-1 in the bottom of the fifth inning when a wild pitch from UCF’s Andrew Deramo got past the catcher and Batista scored. Right-handed freshman Frankie Bartow took over for fellow right-handed freshman Andrew Cabezas in the eighth after Cabezas threw a scoreless seventh inning. Bartow struggled, allowing three consecutive hits and a walk, allowing UCF to cut the Hurricanes’ lead to 7-2. The Knights continued their run, scoring two more runs before the Canes were able to get the first out of the inning. With Miami’s lead dwindling down, Head Coach Jim Morris elected to put in junior closer Bryan Garcia. Garcia led the Canes out of the inning with two consecutive strikeouts. 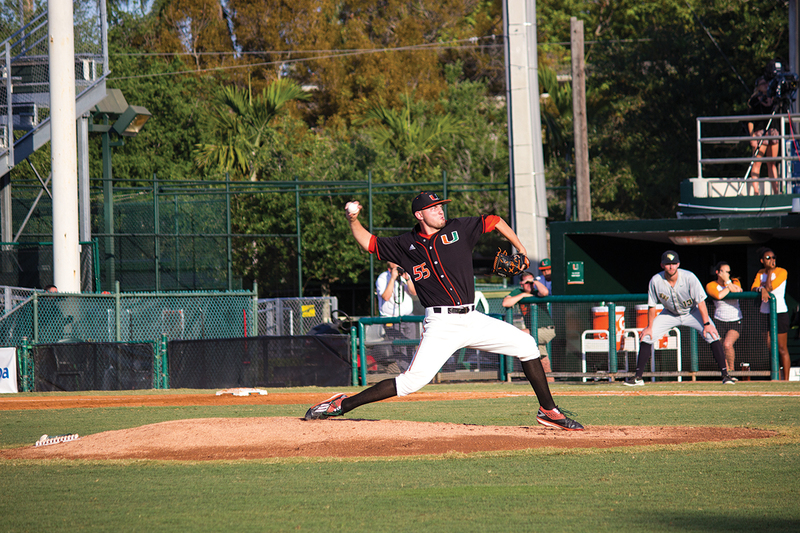 The Canes added their final run in the eighth when junior Edgar Michelangeli scored on a Lopez groundout. Central Florida used three different pitchers in the eighth, while Garcia closed out the Knights himself to end the game in the ninth for his ACC-leading 11th save. “Bryan Garcia is one of those unique guys like Robbie Morrison who came in and asked me if I can close. He wants that role, and he loves going out there with the game on the line,” Morris said. The Canes next play Duke at 6 p.m. on Friday in Durham, North Carolina.